At the DLD Innovation Festival last week in Tel Aviv, big ideas were brought out of the workshop and the bustling Israeli tech scene was on full display. DW was at the event along with young entrepreneurs from over 400 startups gathering to share ideas and generate investment. 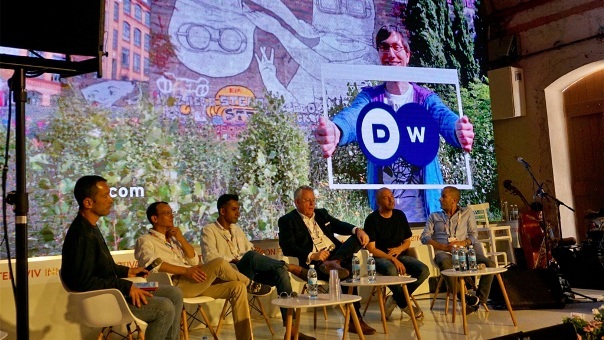 DW organized a startup competition at DLD to highlight people who are doing great work in tech innovation. The winner, the Keepers app, protects children from cyberbullying and alerts parents to suspicious messages and content on their child’s smartphone. The contest titled #Startmeup, awarded Keepers with 2,000 Euros and gave the developers the chance to showcase their app in front of investors from around the world. DW’s Director General Peter Limbourg presented the award and also participated in a panel discussion on the effect of digitization on international media. At the panel, Limbourg emphasized how the audience for international media is being changed by digitization and how a new generation of media consumers needs to be reached through innovative means. Shift, DW’s science and technology program, was at DLD and broadcast the event around the world with innovative ideas from water quality testers that don’t need to get wet to pest control without poison. DW’S involvement in DLD is part of a strategy to promote and publicize digital innovation and creative thinkers from around the world.